Causes for sleep disorders are many, and may include issues such as chronic pain, stress, shift work, jet lag or nocturia. Not planning for sleep, drinking too much caffeine or alcohol, or eating too close to bedtime can also contribute to not getting enough sleep; so may something as seemingly harmless as returning a text late at night. One poll noted that parents believed the number one reason for teen sleep disturbance was their late-night use of cell phones and social media. Not surprisingly, Americans are expected to spend approximately $84.9 billion on sleep aids by the year 2021, a significant increase from $66.3 billion in 2016. The pineal gland is a small endocrine gland found near the center of the brain. It produces the hormone melatonin. Melatonin plays a role in maintaining circadian rhythm and regulates reproductive hormones. The secretion of melatonin is directly influenced by light. According to the director of one Sleep and Research Clinic, “maintaining a synchronized circadian rhythm is important to health and well-being”. When exposed to light during the day, melatonin is suppressed since that is when we are supposed to be productive, not sleeping. Once the sun goes down, exposure to light-emitting devices in the evening that contain more blue light than natural light has a negative impact on melatonin production thus altering the body’s circadian rhythm. The rhythm is disturbed with any exposure to light whether short or long, so there is a no dose effect; zero exposure is the best bet to promote sleep. This becomes problematic because the brain needs sleep in order to do some housekeeping and drain toxins that accumulate during the day. A mouse study found that sleep supports the removal of B-amyloid, a potentially neurotoxic waste product. Blue light is ubiquitous these days and is found in digital screens (flat screen tv’s, computers, video display terminals, smart phones, tablets), LED lights, and electronic devices. LED’s are known to provide better lighting while being more energy efficient than traditional bulbs. But what’s the impact on our health? While all artificial light can have a negative impact on sleep, blue light exposure means optical radiation at short wavelengths that are danger close to melatonin suppression, more than any other type of light. 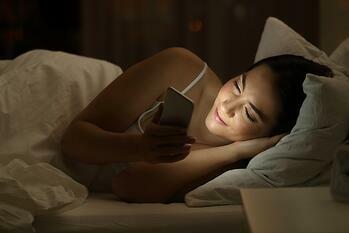 While avoiding these devices in the evening may not be practical, one study compared a blue-depleted circadian sensitive (C-LED) light and a standard fluorescent light. What they found was that the differences in light characteristics should be considered for improvement of responses such as total sleep time, sleep efficiency and slow-wave activity. While there may be other health concerns associated with cell phones and other electronics, from a sleep standpoint, it’s all about timing and scheduling exposure properly for healthy sleep. When this is unavoidable, blue light filter applications or blue light filtering glasses should be used as a precautionary measure. The impact on sleep must be addressed since consequences of the cumulative effects of sleep loss/sleep disorders “have been associated with a wide range of deleterious health consequences including an increased risk of hypertension, diabetes, obesity, depression, heart attack, and stroke.” In addition to sleep concerns, blue light exposure may also have a negative impact on eye health and may increase the risk of macular degeneration. According to the American Optometric Association, a healthy diet incorporating leafy greens, antioxidants, and nutrients that support eye health should also be considered to prevent or delay chronic eye diseases. Lutein and zeaxanthin are antioxidants located in the eye that filter high-energy blue wavelengths of light while protecting healthy cells in the eyes. On the flip side, one rat study found that daytime exposure to blue light increased nighttime melatonin levels and reduced prostate cancer metabolic, signaling, and proliferative activities. So timing really is everything! Proper exposure during the day not only improves sleep, but can boost performance and increase energy. Of course, getting outside with some natural sunlight is encouraged, too.